LEARN MORE — Hare Krishna! Following is a list of books, temples & centers, kirtan artists, and conscious living festivals where you can learn more about Prabhupada's life and teachings, which you may find inspiring in your daily life. 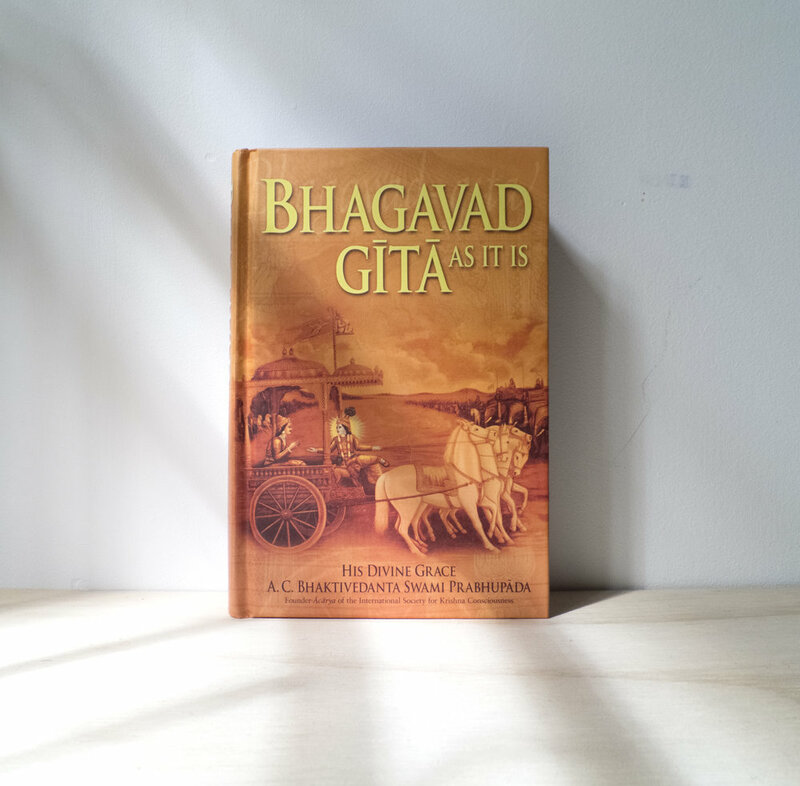 The Bhagavad-gita is an ancient Indian sacred text, embraced around the world as the compact essence of all spiritual philosophy. At the onset of a world war, the warrior Arjuna asks his friend Krishna about the purpose of life, the difference between the self and the material body, and how to understand the ultimate cause of all causes. In just over seven hundred verses, Krishna comprehensively answers all of Arjuna's questions and then reveals His identity as the Supreme Personality of Godhead Himself, appearing on earth to usher in a new era of spiritual understanding. Praised as “masterfully written and thoughtfully executed,” and now available in paperback, Swami in a Strange Land shows how one man with a dream can change the world — a relevant story at a time when the principles of justice, compassion, and peace are being challenged throughout the world. Fifty years ago, a 69-year-old holy man sailed from India with 40 rupees and the determination to re-spiritualize humanity. He arrived in New York at the peak of the Sixties counterculture and inspired a movement that has grown to more than 600 Bhakti Yoga centers and millions of practitioners worldwide. In honor of the fiftieth anniversary of his arrival, bestselling biographer Joshua M. Greene (Here Comes the Sun) delivers a candid, immensely readable account of a spiritual pioneer who demystified India’s ancient yogic culture and showed its relevance to current events. Carefully researched and skillfully crafted, Swami in a Strange Land follows Swami Prabhupada as he rises from anonymous monk to world-renowned spiritual leader. If you would like to visit a Hare Krishna temple or center, education facility or restaurant, there are many locations worldwide. You can find one close to you by visiting the following directory: http://centers.iskcondesiretree.com and browse by city, country or type of venue. Gaura Vani was born in Los Angeles, but at the age of six, moved to Vrindavan, India to study sacred music at a gurukula. There, he learned how to play traditional Indian instruments, such as the harmonium. He brought his knowledge back to the United States, where he performs regularly at yoga studios and temples, along with touring to larger venues and festivals, such as Lollapalooza. He also tours internationally to countries such as Australia, Brazil and India. As well as this he founded the first ever sold-out Chant4Change kirtan-festival in Washington, DC during President Obama's inauguration. The Mayapuris are a kirtan band breathing new life into sacred 5,000-year-old songs, inspiring yogis, swamis, rock stars, and everyday people to sing, dance, and be transported. Hailing from the American South, Sweden, Columbia, and India, the young drummers, singers, and dancers that make up The Mayapuris were connected by the tiny West Bengal city of Mayapur, the birthplace of modern kirtan. The Mayapuris began performing academic-style music demonstrations, but quickly developed their own wild, showmanship style. Their distinctive sound is the product of a shared love of kirtan, global upbringings, a punk rock attitude, and a genuine desire to serve the world with powerful, uplifting music. California based Kirtaniyas are a global collective of musicians, producers and dancers. These energetic, multitalented artists grew up in a Vedic culture of song, dance, philosophy and devotion between ashrams and temples both in India and the western world. Vijay Krsna, band leader, studied devotional Indian folk music known as “Kirtan” in the sacred village of Vrindavana, India. This rare traditional art form is an ancient call-and-response mantra chanting practice, that originated in the Indian subcontinent over 5000 years ago. Joined together with his musically gifted wife Sarasvati, soulful vocalist Rasika and drummer Nitai, Vijay formed the Kirtaniyas in 2009. They have since expanded the group, sometimes performing with up to 12 members on stage. They have travelled the world to over 15 countries infusing new life to these ancient chants with youthful spirit and energy. Besides the largely traditional approach to their acoustic sets, the Kirtaniyas push the boundaries of genre to combine all of their passions into one new and unique sound. Melodious electronic dance music and subsonic bass meets the call and response singing of ancient Sanskrit mantras, accompanied by live acoustic instruments. This is where the boundaries between performers and audience become blurred, everybody is united in one voice and everybody becomes the band. Shakti Fest is the premiere yoga, sacred music, and personal growth festival in the country celebrating the divine feminine. Since 2011, for five days each May, they have featured the best yoga teachers, Kirtan musicians, and workshop leaders in the world. They are part of the Center for Spiritual Studies, a 501c3 nonprofit that supports charities across the globe, mainly in India. Proceeds generated each year, after they cover their costs, go to their chosen causes. They accept donations to help them provide extraordinary festivals and give support to those less fortunate than them. Bhakti Fest is the premier yoga, sacred music, and personal growth festival in the United States. Since 2009, for six days each September, they have featured the best Yoga Teachers, Kirtan Musicians, and Workshop Leaders in the world. They are part of the Center for Spiritual Studies, a 501c3 nonprofit that supports charities across the globe, mainly in India. Proceeds generated each year, after they cover our costs, go to their chosen causes. They accept donations to help them provide extraordinary festivals and give support to those less fortunate than them. Bhakti Fest celebrates the devotional paths of yoga, Kirtan (sacred music), and meditation. The festival is a drug and alcohol free vehicle for evolution of human consciousness through a heart-centered revolution. Bring your yoga mats this September to the idyllic Joshua Tree Retreat Center, located in the beautiful region east of Los Angeles. Practice with the best yoga teachers in the world, dance to sacred music by world-renown Kirtan artists, and take workshops with leaders in the field of personal growth. Camp out beneath the stars or stay at one of their many accommodations on and offsite; enjoy the swimming pool and free filtered drinking water; stop in at The Bhakti Family Village and expose your children to other enlightened youth and families; enjoy the best vegetarian food at any festival. They offer Student, Senior, Military and Local Resident discounts.